If I had felt McCain were speaking to me, his message about checkbook management would have seemed like an insult. I know how to balance a checkbook; most people who are lucky enough to have one do I would imagine. Anyone who can do simple math, such as the administrators of the federal government presumably, can see that there is a problem when more is going out than is coming in. The trick, and this is where we need great leadership, is in figuring out how to make sure there is a little more coming in than is going out. And I don’t think that knowing there is a deficit is going to make a worker facing job loss, a truck driver facing huge gas bills, a sick person facing doctor bills, or a homeowner facing a balloon payment suddenly get more to come in. Urging every hardworking American to take responsibility for his or her own financial issues will not protect us from the mismanagement of gigantic financial institutions such as Enron and Morgan Stanley and Freddie Mac, financial crises caused by nearsighted health care policies, shortcomings in our public education system, or financial devastation resulting from climate-related problems such as floods and drought and storms. Balancing a checkbook is not a policy or a vision. It’s a skill that the current administration lacks. Palin’s message that taking care of yourself will take care of the health crisis may resonate with some people: smokers and overeaters, for example. But does it sit well with people who suffer from Lyme disease or arthritis or salmonella poisoning? What about people who have cancer caused by toxic runoff from large industry? Upon hearing that message, do they think, Oh, yes, if I start walking twenty minutes a day that should take care of things and my mounting hospital bills? Taking care of your health is an important responsibility. But people who want to become the top administrators of an entire nation need to talk about their own responsibilities: specifically, what they are going to do to help the people of that nation deal with a looming crisis. Large corporations do not need our help if helping them means hurting the rest of us, which it almost always does. We do not need to give large corporations permission to avoid the responsibilities the rest of us have for safeguarding our environment and our health. We do not need to protect their ability to make large sums of money now at the expense of our futures. The people who have thus far taken away our freedoms are within our own borders, not in Iraq. To protect those freedoms we don’t need to go anywhere but D.C. The erosion of the right to free speech, to petition the government for a redress of grievances, against unreasonable and unwarranted searches and seizures, to due process, to a speedy and public trial, and against cruel and unusual punishment has occurred at our own hands. And we have shown ourselves to be indifferent to the rights not only of those within our borders but also of those outside our own borders who fall under our control, diminishing our stated values and principles by restricting them geographically, temporally, and even by nationality, race, creed, and sexual orientation. Sarah Palin tried to have a large quantity of books banned from the Wasilla public library including Flowers for Algernon, I Know Why the Caged Bird Sings, The Adventures of Tom Sawyer, and Leaves of Grass. I don’t want my liberties eroded in the name of someone else’s religion or squeamishness. Our Constitution was designed to prevent such tyrrany. 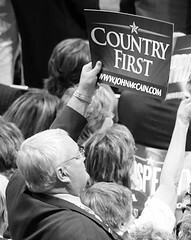 The theme of the last night of the convention was Country First. The idea is that we Americans should set aside our differences and put our country first. The problem with that reasoning is that our differences are far too important; they are about essential values, about whether, for example, we value property rights more than human rights, big business over human health, the teachings of one religion over freedom of thought. I don’t belong at that party. When I snapped off the radio, I thought, “I don’t want country first. I want life first.” And not just the lives of unborn fetuses but the lives of ailing senior citizens, the lives of the lower classes, the lives of all children whether they show a great deal of promise or not, the lives of animals and trees, the life within our watersheds and rivers and oceans, in the canopy, in the soil. Not just the lives of Americans but also the lives of folks across the planet whether in Iraq or Pakistan or Darfur or Gaza or South Ossetia. And not just the lives of people but the life of ecosystems all over this planet. McCain and Palin talk about freedom and responsibility. These are good themes, but I would talk about them much differently. I would talk about earning our freedom to eat as we want, to be who we are, to move about freely, and to live free of the fear of being macheted or nuked or missiled or starved or tortured or raped or enslaved. How do we earn that freedom? By (1) caring for the place we live and the life that surrounds us and honoring our differences and (2) simply by being alive. This is the responsibility we all share: to care for one another and, therefore, by extension, ourselves. The message is not flashy, sarcastic, tough, or spunky. But it’s true. Image by David All, 2008, Creative Commons license.